‘Tis the season to be jolly and online slot developer Microgaming has chosen to take full advantage of the festive season to release this 5 reel, 1,024 ways to win slot that has a distinctive Christmassy feel to it. 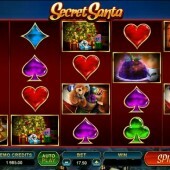 The online slots industry has already felt the full force of Christmas with previous releases including Playtech’s festive-themed Santa Surprise and Microgaming’s very own previous festive frolics slot Deck the Halls. Now it is that time of year again when slots players brace themselves for the next festive release and hoping that it is a classic-in-the-making rather than a gift they would rather leave unopened under the tree. If anyone can pull it off then it's the trusty guys at Microgaming who have a number of Christmas slots releases already to their name. This slot is another fine release from Microgaming and is certain to get you into the Christmas spirit with a range of icons that will inspire you to reach for the latest Michael Buble Christmas album. Symbols on the reels include Santa himself, a Christmas pudding, a Christmas turkey, a Christmas cracker, a log fire and some presents. 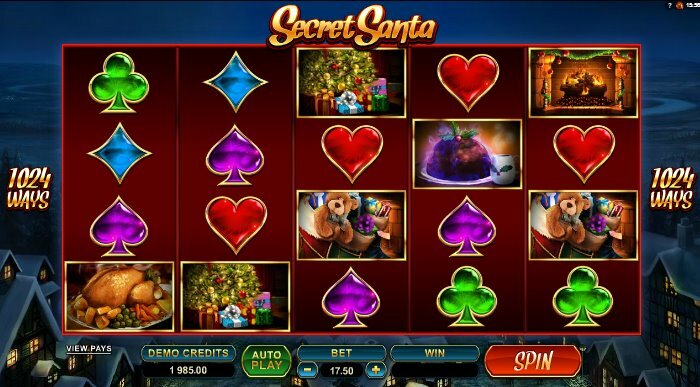 The main draw of this Christmas slot is the Secret Santa Bonus that is randomly triggered and gives you the chance to trigger one of seven mystery features. These mystery features comprise of Wild Reels, Wild Boost, Free Spins, Mystery Multiplier, Dashing Wilds, Scatter Spree and Rolling Reels. The Free Spins and Mystery Multiplier features are fairly self explanatory. The Wild Reels feature will see a selection of the reels turn completely Wild. The Wild Boost will see a random symbol chosen and all of those symbols on the reels will be turned Wild. The Scatter Spree will see all symbols pay out. The Rolling Reels feature will see the reels act as Cascading Reels for one spin where symbols that complete winning combinations will then disappear and be replaced by the symbols above dropping into the positions left. The Dashing Wilds is perhaps the most unique feature on this slot. An entire reel will turn Wild as you are about to spin. Once you press spin, the Wild symbols will then move from left to right across the reels at different speeds and end up on different reels when the spin has finished to help you complete winning combinations across all five reels. Win 5 of a Kind Again! Secret Santa also comes with a 5 of a Kind Win Again feature. This is where 5 of a kind wins in the regular game play will payout and then change into another symbol to form an extra 5 of a kind win. I have to admit, when I heard this slot was coming out I genuinely felt it was just a gimmick slot from Microgaming that was going to struggle to be more entertaining than the developer’s Gift Rap slot. However, I really enjoyed playing this slot and the endless winning possibilities with the randomly triggered Secret Santa Bonus gives this game a feeling of fun anarchy that will really help you get into the Christmas mood.